This last week I’ve had a couple of apples forlornly staring at me every time I entered my kitchen. They were a bit past peak and really needed to by used. However, I just could not decide how to use them up. On Friday I was thumbing through my back issues of The Baking Sheet by King Arthur Flour and lo and behold I found my answer. I decided to make these just a bit healthier by using half whole wheat and half all-purpose flour and by substituting canola oil for the butter. These are lightly sweet even with a little cinnamon sugar sprinkled on top. If you would like the muffins a little sweeter add 1/2 cup of raisins. Enjoy these for breakfast or a mid-afternoon snack. Preheat oven to 400 degrees. Grease a 12 well muffin tin with non-stick cooking spray. In a small bowl, mix together the cinnamon sugar and set aside. In a large bowl, whisk together the sugar, baking powder, salt, cinnamon and flour. In a smaller bowl, whisk together the egg, milk and canola oil. Add the wet ingredients to the flour mixture and stir until they are about half way combined. Add the apples and walnuts and stir just until all the flour is incorporated and the apples and walnuts are evenly distributed. Scoop equal amounts of batter into the 12 prepared muffin wells. Sprinkle each muffin with cinnamon sugar. Bake 18-22 minutes, until a cake tester comes out clean. Let the muffins cool for 5 minutes before removing to a wire rack. Let cool completely. 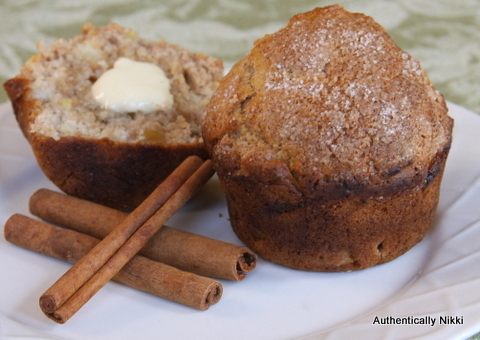 This entry was posted in Breakfast, Muffins and Quick Breads and tagged apples, breakfast, muffins by authenticallynikki. Bookmark the permalink.